Here are some houses doing a bit of skating. My skating days are numbered, if spring is in fact on its way... I think a final skate is in order soon, because it is still definately cold enough. Today is an exiting day of adding numbers for taxes! I can't actually DO the taxes, but I can add up all my receipts and put them in an envelope for the accountant. Simple! My friend Prisca gave me the yummiest cookie yesterday, and it was so easy! mix eggs first, then the rest. bake in preheated oven at 350 for 10-12 minutes. I love that illustration! It is Sweet! And that cookie recipe looks fantastic (I am all about easy baking and such). In our new place where we have little, I am glad to say I have PB and eggs. Just need some brown sugar and I am good to go!! Hooray! 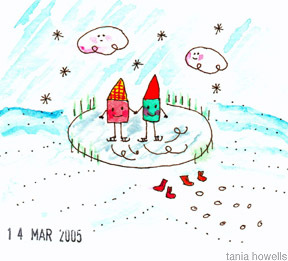 Those houses are gorgeous - I love how their little red shoes have been cast aside so they can put their skates on! Teeny tiny shoes and teeny tiny footprints! Cute! Cute! Cute! I love the date stamp. I have one of those...I really should use it more often. Skating? In Ottawa the canal is mush. Its still open, but un-skatable, so people are walking it. Boo, sadness. i totally tried out your cookie recipe tonight....mmmm deeelicious. thought i could have baked them a little longer. thanks for the simple and sweet recipe.